ELENCO VITTIME ALLEATE - Benvenuti su navenovascotia! 1. ADAMS, Fireman, NORMAN, S.S. Nova Scotia (Liverpool). Merchant Navy. 28th November 1942. 2. AGIUS, Able Seaman, S P J, S.S. Nova Scotia (Liverpool). Merchant Navy. 28th November 1942. Age 38. Son of Paul and Annette Agius. 3. ALLEN, Assistant Steward, JAMES, S.S. Nova Scotia (Liverpool). Merchant Navy. 28th November 1942. Age 52. 4. ANDRUS, Chief Butcher, ALFRED, S.S. Nova Scotia (Liverpool). Merchant Navy. 28th November 1942. Age 42. Son of William and Sarah Andrus; husband of Florence Mabel Andrus, of Walton, Liverpool. 5. ATTARD, Able Seaman, JOSEPH, S.S. Nova Scotia (Liverpool). Merchant Navy. 28th November 1942. Age 33. Son of Salvator and Laurentia Attard, of Kala, Gozo, Malta, G.C. 6. AUSTEN, Steward, JAMES GEORGE, S.S. Nova Scotia (Liverpool). Merchant Navy. 28th November 1942. Age 54. Husband of Isabel Austen, of Bootle, Lancashire. 7. BANNER, Steward, LESLIE HILTON, S.S. Nova Scotia (Liverpool). Merchant Navy. 28th November 1942. Age 37. 8. BLACK, Barber, THOMAS HENRY, S.S. Nova Scotia (Liverpool). Merchant Navy. 28th November 1942. Age 45. 9. CAPSTICK, Fourth Engineer Officer, GEORGE, S.S. Nova Scotia (Liverpool). Merchant Navy. 28th November 1942. Age 25. Son of John and Sarah Capstick, of Burton, Cheshire. 10. CARRAN, Chef (Asst. ), SAMUEL, S.S. Nova Scotia (Liverpool). Merchant Navy. 28th November 1942. Age 44. Son of Samuel and Margaret Carran. 11. CONSTANTINE, Assistant Steward, LEWIS, S.S. Nova Scotia (Liverpool). Merchant Navy. 28th November 1942. Age 33. Son of Charles Henry Whammond Constantine and Christine Constantine; husband of Dorothy Constantine, of Fazakerley, Liverpool. 12. 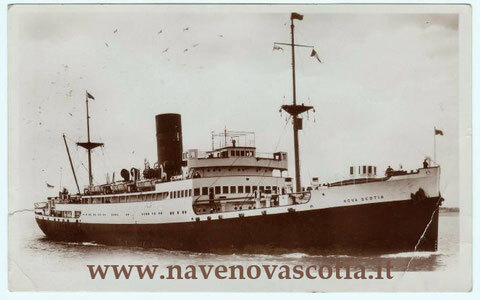 COONEY, Steward's Boy, PATRICK, S.S. Nova Scotia (Liverpool). Merchant Navy. 28th November 1942. Age 18. Son of Edward and Kate Cooney, of Orrell, Liverpool. 13. DALE, Cook, ERIC JOHN, S.S. Nova Scotia (Liverpool). Merchant Navy. 28th November 1942. Age 32. Son of William Henry and Annie Dale, of Waterloo, Liverpool. 14. DAMONS, Fireman, STEPHEN ANDREW, S.S. Nova Scotia (Liverpool). Merchant Navy. 28th November 1942. Age 42. Husband of Magdeline Maria Damons, of Durban, Natal, South Africa. 15. DAWKINS, Third Officer, ARTHUR PARR, S.S. Nova Scotia (Liverpool). Merchant Navy. 28th November 1942. Age 22. 16. DONALDSON, Deck Hand, GEORGE, S.S. Nova Scotia (Liverpool). Merchant Navy. 28th November 1942. Age 28. Son of Samuel Donaldson, and of Alda Donaldson, of Liverpool. 17. DOYLE, First Radio Officer, GERALD FRANCIS, S.S. Nova Scotia (Liverpool). Merchant Navy. 28th November 1942. Age 45. Son of John and Sara Doyle, of Dublin, Irish Republic; husband of Mary Doyle, of Ballybough, Co. Dublin. 18. ECCLESTON, Steward, JOHN, S.S. Nova Scotia (Liverpool). Merchant Navy. 28th November 1942. Age 34. Son of James Henry and Elizabeth Eccleston; husband of Freda E. Eccleston, of Waterloo, Liverpool. 19. EVANS, Sailor, WILLIAM ROBERT, S.S. Nova Scotia (Liverpool). Merchant Navy. 28th November 1942. Age 21. 20. FLEETWOOD, Steward, PETER, S.S. Nova Scotia (Liverpool). Merchant Navy. 28th November 1942. Age 31. 21. FOUCHE, Scullion, F J, S.S. Nova Scotia (Liverpool). Merchant Navy. 28th November 1942. Alice Green, of Bootle, Lancashire. 23. GREEN, Steward, JOHN, S.S. Nova Scotia (Liverpool). Merchant Navy. 28th November 1942. Age 44. 24. GREEN, Cadet, NORMAN DYMOND, S.S. Nova Scotia (Liverpool). Merchant Navy. 28th November 1942. Age 19. 25. HALLIDAY, Chief Butcher, ALEXANDER, S.S. Nova Scotia (Liverpool). Merchant Navy. 17th June 1942. Age 64. Son of James Halliday, and of Elizabeth Halliday, of Liverpool. 26. HARRIS, Butcher, ARTHUR, S.S. Nova Scotia (Liverpool). Merchant Navy. 28th November 1942. Age 30. Son of Charles and Elizabeth Harris. 27. HARRISON, Pantryman, WILLIAM JAMES, S.S. Nova Scotia (Liverpool). Merchant Navy. 28th November 1942. Age 34. Son of William Richard and Josephine Harrison; husband of Lily Harrison, of Seaforth, Liverpool. 28. HAYES, Assistant Cook, JOHN HENRY, S.S. Nova Scotia (Liverpool). Merchant Navy. 28th November 1942. Age 34. Son of John Henry and Hannah Hayes; husband of Margaret Hayes, of Liverpool. 29. HENDER, Master, ALFRED, S.S. Nova Scotia (Liverpool). Merchant Navy. 28th November 1942. Age 51. Son of William Richard and Annie Hender; husband of Jane Ann Hender, of Crosby, Liverpool. 30. HENNEBERG, Electrician, HUGO, S.S. Nova Scotia (Liverpool). Merchant Navy. 28th November 1942. 31. HEWITSON, Fourth Engineer Officer, THOMAS ARTHUR, S.S. Nova Scotia (Liverpool). Merchant Navy. 28th November 1942. Age 50. Husband of M. E. Hewitson, of Waterloo, Liverpool. 32. HUGHES, Assistant Baker, RICHARD, S.S. Nova Scotia (Liverpool). Merchant Navy. 28th November 1942. Age 38. 33. IRVEN, Ordinary Seaman, RICHARD, S.S. Nova Scotia (Liverpool). Merchant Navy. 28th November 1942. Native of South Africa. 34. JACOBSON, Cadet, ARTHUR REGINALD, S.S. Nova Scotia (Liverpool). Merchant Navy. 28th November 1942. Age 20. Son of Arthur Reginald and Hilda Jacobson, of Hull. 35. JOHNSTON, Assistant Cook, ROBERT RODGERS, S.S. Nova Scotia (Liverpool). Merchant Navy. 28th November 1942. Age 28. Son of Samuel and Catherine Johnston. 36. KEATLEY, Waiter, JOHN LESLIE, S.S. Nova Scotia (Liverpool). Merchant Navy. 28th November 1942. Age 22. Son of John Keatley, and stepson of E. Keatley, of Walton, Liverpool. 37. KINSEY, Greaser, WILLIAM GEORGE, S.S. Nova Scotia (Liverpool). Merchant Navy. 28th November 1942. Age 51. Husband of M. W. Kinsey, of Durban, Natal, South Africa. 38. KLEINHENS, Ordinary Seaman, JOHN, S.S. Nova Scotia (Liverpool). Merchant Navy. 28th November 1942. 39. KNIGHT, Pantryman, EDWARD, S.S. Nova Scotia (Liverpool). Merchant Navy. 28th November 1942. Age 55. Son of Edward and Marie Knight; husband of Annie Knight, of Antwerp, Belgium. 40. LAFITE, Boatswain, CHARLES AUGUSTUS, S.S. Nova Scotia (Liverpool). Merchant Navy. 28th November 1942. Age 31. Son of Peter and Caroline Lafite, of Woodstock, Cape Province, South Africa. 41. LAMELETTIE, Fireman, DANIEL J., S.S. Nova Scotia (Liverpool). Merchant Navy. 28th November 1942. Age 24. Son of Nicholas and Evelyn Lamelettie; nephew of Mrs. V. M. Lamelettie, of Umzinto, Natal, South Africa. 42. LEASK, Waiter, THOMAS, S.S. Nova Scotia (Liverpool). Merchant Navy. 28th November 1942. Age 43. 43. LEWIS, Greaser, RICHARD CHARLES, S.S. Nova Scotia (Liverpool). Merchant Navy. 28th November 1942. Age 36. Son of Richard Charles and Beatrice Lewis; husband of Nellie Margaret Lewis, of Durban, Natal, South Africa. 44. LINDLEY, Ordinary Seaman, HARRY, S.S. Nova Scotia (Liverpool). Merchant Navy. 28th November 1942. Age 19. 45. MATTHEWS, Able Seaman, ANDREW, S.S. Nova Scotia (Liverpool). Merchant Navy. 28th November 1942. Age 46. 46. MAWDSLEY, Liason Officer, JAMES, S.S. Nova Scotia (Liverpool). Merchant Navy. 28th November 1942. Age 43. Husband of Florence Mawdsley, of Crosby, Liverpool. 47. MAYBOURN, Sailor, JAMES ALFRED BRUCE, S.S. Nova Scotia (Liverpool). Merchant Navy. 28th November 1942. Age 19. Son of Ralph Maybourn, and of Barbara Maybourn, of Mutley, Plymouth. 48. McCLUSKEY, Leading Seaman, JAMES, D/JX 194509. H.M.S. President III. Royal Navy. lost in S.S. Nova Scotia. 28th November 1942. Age 28. Son of James and AnnieMcCluskey, of Belfast, Northern Ireland. 49. METCALFE, Engineer Officer, HARRY SYCAMORE, S.S. Nova Scotia (Liverpool). Merchant Navy. 28th November 1942. Age 23. 50. MILLER, Purser, JAMES RUTHERFORD, S.S. Nova Scotia (Liverpool). Merchant Navy. 28th November 1942. Age 48. Husband of Maggie Armour Miller, of West Derby, Liverpool. 51. MILLER, Steward, ROBERT WILLIAM, S.S. Nova Scotia (Liverpool). Merchant Navy. 28th November 1942. Age 34. Husband of Lilian May Miller, of Guildford, Surrey. 52. McDONALD, Ordinary Seaman, J R, S.S. Nova Scotia (Liverpool). Merchant Navy. 28th November 1942. 53. McHALE, Steward, ROBERT, S.S. Nova Scotia (Liverpool). Merchant Navy. 28th November 1942. Age 42. 54. McLEAN, Waiter, JOHN ROBERT, S.S. Nova Scotia (Liverpool). Merchant Navy. 28th November 1942. Age 42. 55. NAIDOO, Fireman, MITCHELL, S.S. Nova Scotia (Liverpool). Merchant Navy. 28th November 1942. Son of Naraina Samy Naina Naidoo and Serinah Naidoo, of Colesberg, Cape Province, South Africa. 56. NAILARD, Convoy Signalman, GEORGE IVOR, C/JX 270578, S.S. Nova Scotia, Royal Navy. 28 November 1942. Age 20. Son of Thomas and Mary Alice Nailard, of Brighton, Sussex. 57. NALLY, Second Radio Officer, FRANCIS, S.S. Nova Scotia (Liverpool). Merchant Navy. 28th November 1942. Age 42. Son of Nicholas and Mary Naily. 58. NEVARD, Chief Baker, REGINALD GORDON, S.S. Nova Scotia (Liverpool). Merchant Navy. 28th November 1942. Age 28. Son of J. H. and Annie Nevard. 59. O'DONNELL, Assistant Cook, NEIL, S.S. Nova Scotia (Liverpool). Merchant Navy. 28th November 1942. Age 29. 60. O'HAGAN, Able Seaman, CHARLES ALEX, S.S. Nova Scotia (Liverpool). Merchant Navy. 28th November 1942. Age 65. 61. O'HANLAN, Chef, CHARLES, S.S. Nova Scotia (Liverpool). Merchant Navy. 28th November 1942. 62. PATE, Storekeeper, GEORGE DOUGLAS, S.S. Nova Scotia (Liverpool). Merchant Navy. 28th November 1942. Age 26. 63. PITT, Fireman, DOUGLAS HARTWELL, S.S. Nova Scotia (Liverpool). Merchant Navy. 28th November 1942. Son of William Douglas Pitt, and of Elizabeth Cathrine Pitt, of Durban, Natal, South Africa. 64. RAITT, Second Engineer Officer, WILLIAM ALLAN, S.S. Nova Scotia (Liverpool). Merchant Navy. 28th November 1942. Age 44. Son of Allan and Annie Raitt; husband of Florence Raitt, of Liverpool. 65. RATTER, Greaser, JAMES, S.S. Nova Scotia (Liverpool). Merchant Navy. 28th November 1942. Age 39. Husband of Natalie Caroline Ratter, of Clairwood, Natal, South Africa. 66. REES, Waiter, HARRY, S.S. Nova Scotia (Liverpool). Merchant Navy. 28th November 1942. Age 32. 67. REID, Third Engineer Officer, FELIX JOSEPH GERRARD, S.S. Nova Scotia (Liverpool). Merchant Navy. 28th November 1942. 68. Age 28. Son of James Reid, and of Mary Bridget Reid, of Lurgan, Co. Armagh, Northern Ireland. His brother Roger Anthony Lyon Reid also fell. 69. REYNOLDS, Cook, WILLIAM JAMES, S.S. Nova Scotia (Liverpool). Merchant Navy. 29th November 1942. Age 32. Son of Mr. and Mrs. John Reynolds; husband of Winifred Reynolds, of Liverpool. 70. RIDER, Steward, FRANK, S.S. Nova Scotia (Liverpool). Merchant Navy. 28th November 1942. Age 49. Son of Tom and Helen Jane Rider. 71. RILEY, Cook, THOMAS PATRICK, S.S. Nova Scotia (Liverpool). Merchant Navy. 28th November 1942. Age 27. Son of John and Margaret Riley; husband of Margaret Riley, of Liverpool. 72. ROBERTS, Barkeeper, HARRY, S.S. Nova Scotia (Liverpool). Merchant Navy. 28th November 1942. Age 32. 73. ROBERTS, Baker, JOHN, S.S. Nova Scotia (Liverpool). Merchant Navy. 28th November 1942. Age 52. Husband of M. Roberts, of Huyton, Liverpool. 74. ROWSON, Assistant Cook, PATRICK, S.S. Nova Scotia (Liverpool). Merchant Navy. 28th November 1942. Age 29. 75. RYCROFT, Waiter, JOHN FREDERICK, S.S. Nova Scotia (Liverpool). Merchant Navy. 28th November 1942. Age 29. Son of Mr. and Mrs. J. F. Rycroft, of Southampton. 76. SAUNDERS, Fireman, WILLIAM, S.S. Nova Scotia (Liverpool). Merchant Navy. 28th November 1942. 77. SHELTON, Third Radio Officer, STANLEY CLIFFORD STOKES HOWET, S.S. Nova Scotia (Liverpool). Merchant Navy. 28th November 1942. 78. SMITH, Assistant Cook, JOHN, S.S. Nova Scotia (Liverpool). Merchant Navy. 28th November 1942. Age 21. Son of John and Margaret Smith, of Seaforth, Liverpool. 79. STINISSEN, Baker, EDWARD, S.S. Nova Scotia (Liverpool). Merchant Navy. 28th November 1942. Age 53. 81. THOMAS, Assistant Steward, THOMAS, S.S. Nova Scotia (Liverpool). Merchant Navy. 28th November 1942. 82. TINSLEY, Steward, WILLIAM, S.S. Nova Scotia (Liverpool). Merchant Navy. 28th November 1942. Age 19. 83. TORNQUIST, Chief Engineer Officer, JAMES, S.S. Nova Scotia (Liverpool). Merchant Navy. 28th November 1942. Age 60. 84. VASEY, Waiter, WILLIAM ROBERT, S.S. Nova Scotia (Liverpool). Merchant Navy. 28th November 1942. Age 32. 85. WARREN, Chief Officer, JAMES ARNOLD, S.S. Nova Scotia (Liverpool). Merchant Navy. 28th November 1942. Age 39. Son of George Percy and Edith Helen Warren; husband of Bertha A. Warren. of Manor Park. Essex. 86. WATTERSON, Second Officer, ALLAN, D S C, S.S. Nova Scotia (Liverpool). Merchant Navy. 28th November 1942. Age 32. Son of George and Jane Watterson. 87. 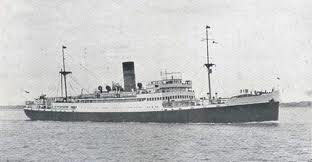 WHITEHILL, Assistant Purser, LAURENCE STUART, S.S. Nova Scotia (Liverpool). Merchant Navy. 28th November 1942. Age 25. 88. WILKINSON, Carpenter, HERBERT, S.S. Nova Scotia (Liverpool). Merchant Navy. 28th November 1942. Age 40. Son of John Holmes Wilkinson and Ada Ann Wilkinson; husband of Lillie Wilkinson, of Bootle, Lancashire. 89. WILLIAMS, Scullion, EDWARD WILLIAM, S.S. Nova Scotia (Liverpool). Merchant Navy. 28th November 1942. Age 19. Son of James Hindle Williams and Mary Jane Williams, of Liverpool. 90. WILLIAMS, Fifth Engineer Officer, HARRY TATTERSALL, S.S. Nova Scotia (Liverpool). Merchant Navy. 28th November 1942. Age 37. Husband of Ena Williams, of Backford, Cheshire. 91. WILSON, Greaser, GEORGE EDWARD, S.S. Nova Scotia (Liverpool). Merchant Navy. 28th November 1942. Age 25. Son of Mrs. A. Wilson, of Durban, Natal, South Africa. 92. WILSON, Cook, HENRY, S.S. Nova Scotia (Liverpool). Merchant Navy. 28th November 1942. Age 37. Son of William and Esther Wilson, of Liverpool. 93. WILSON, Linen Keeper, JAMES, S.S. Nova Scotia (Liverpool). Merchant Navy. 28th November 1942. Age 39. YON, Fireman, EDWARD JOHN, S.S. Nova Scotia (Liverpool). Merchant Navy. 28th November 1942. Age 25. Son of George and Helen Yon, of Durban, Natal, South Africa.